I’m a recovering perfectionist. Before I had children, my house was immaculate. You could probably inspect the house with a white glove. There was a place for everything, and everything was in its place. I could tell you the exact location of everything I owned and find it within seconds. Need some eye drops? They're in the medicine cabinet on the second shelf. How about a waffle iron? In the bottom cabinet on the far right, next to the George Forman grill. Ski mask? Check inside the plaid sweater box at the back of the closet, above the winter jackets. Although, since we live in Texas, I'm baffled at why we even have a ski mask. Halloween costume? Robbing a bank? Now, as a mother of three, I have come to terms with the fact that nothing is perfect. Life is messy—especially when you have kids. A good example is family pictures. You dress the kids up in their Sunday best and expect them to smile, pose, and sit still while you capture the perfect picture. If only it were that easy! A couple of years ago, I went out and bought my kids—Paisley (who was age 3 at the time) and Peyton (then, age 16 months)—matching holiday outfits at Baby Gap, specifically for the purpose of taking Christmas pictures. I dressed them up in their fancy matching outfits, curled Paisley's hair just so, loaded them up in our little Kia Spectra (we now have a mini-van), and headed to the Sugar Shack to visit Santa. It was Peyton's first picture with Santa, and I had visions of my two happy, incredibly adorable children sitting calmly in Santa’s lap, beaming up into his jolly face, creating the perfect Hallmark Christmas card pose. Ha! First, we had to wait in line. If you didn't already know, children don’t like to wait in lines. They fidget, they run around, they squirm. Sometimes, they even throw tantrums. Plus, waiting in line gives the kids plenty of time to mess up their hair or spill something on their clothes. Peyton, on the other hand, screamed. 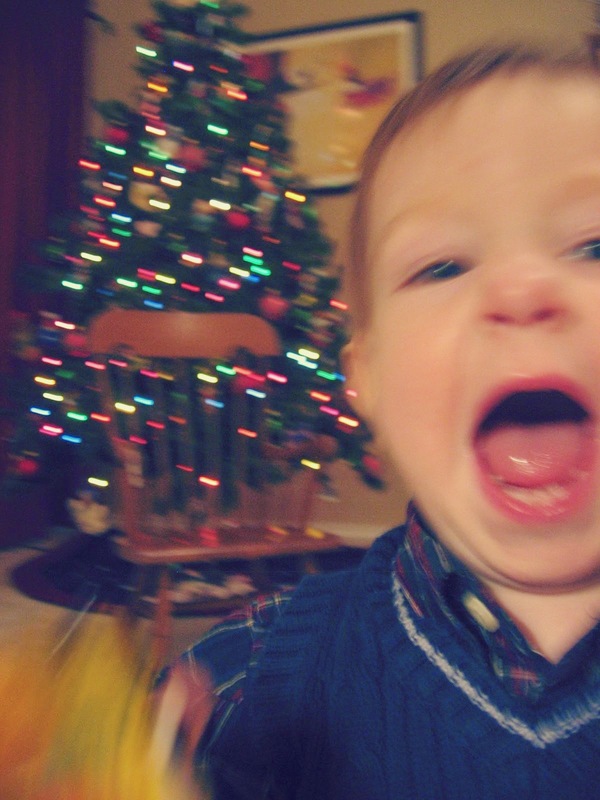 A full-blown, ear-piercing, top-of-his-lungs scream. I think he might have even shattered some of the intricate glass ornaments on the nearby Christmas tree. It was all the poor Santa could do to keep Peyton from flopping out of his lap. My dreams were crushed! The photographer, who was quickly running out of tricks, suggested that John and I sit with the kids in the picture, to help calm Peyton down. However, I wasn't prepared to have my picture taken. I wasn’t even wearing make-up. I grudgingly smiled as I held my now red and puffy, teary-eyed son. So much for the perfect picture I imagined. When we got home, I decided we should try again, this time without Santa. I was determined. A woman on a mission. 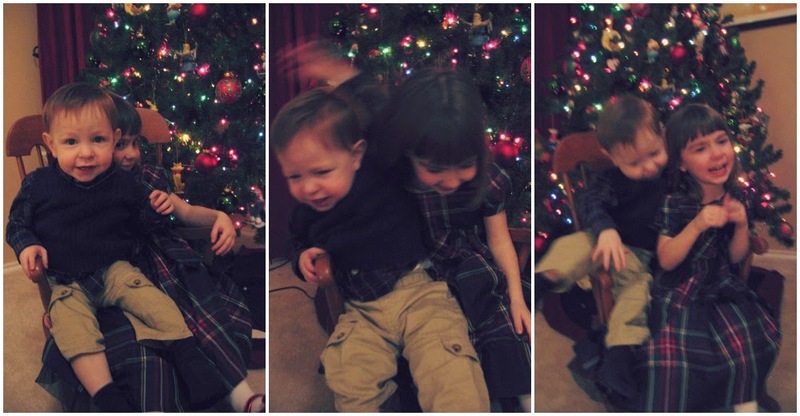 No one was going to thwart my plans for a perfect Christmas picture! Besides, the kids were already dressed up, and getting them dressed is half the battle. The Christmas tree would make a festive backdrop, and I hoped the kids would be more relaxed at home. Boy, was I wrong! Again. After what seemed like forever without capturing the perfect moment on film, I finally surrendered. Besides, there has to be at least one decent picture in the 101 pictures I took, right? I was disappointed, but I realized that perfect is not always so perfect. Some of my favorite pictures from that Christmas are not the ones that were perfectly staged, but the ones where the kids are just being themselves… Peyton dancing on the coffee table, Paisley giving me that pouty look that I thought was reserved only for teenagers, Peyton crawling over the side of the rocking chair. Even the pictures of them crying make me smile. As I look back on those perfectly imperfect pictures, I appreciate the old adage "they’re only this age once," and I try to savor the moments before they’re gone—the good, the bad, and even the imperfect. Does that mean I’ve given up my quest for the perfect picture? No way! You’ll see us standing in line at the Sugar Shack again this year, dressed in our fancy Christmas clothes, trying to capture the perfect picture. But this time, I’ll be wearing make-up. Just in case.